Don your quackers! Spring has sprung in Seattle and what better way for folks all-ages to experience the season on land and sea than aboard a duck! 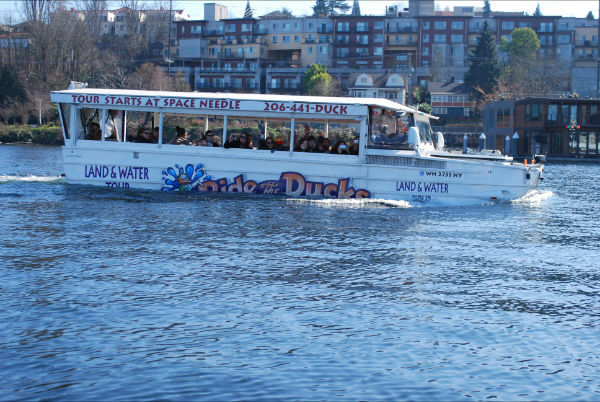 Ride the Ducks of Seattle is an engaging historical city tour of Seattle, aboard an amphibious vehicle that begins its tour on land and makes its way into Lake Union mid-tour so locals and visitors alike can experience Seattle in all its glory. And get this: Ride the Ducks is open 362 days a year at their Seattle Center location (and a second departure location at Westlake Center from April-December)! Most cities don’t have a duck tour, so it’s a very unique way to see the sights and sounds of downtown Seattle, the Waterfront, Fremont, and Lake Union. 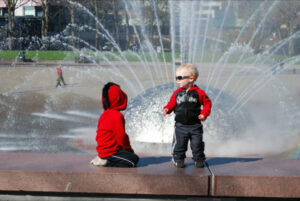 Momma tip: Use the restroom before you arrive; there are only port-a-potties at the Seattle Center location. A sunny day on Lake Union aboard Ride the Ducks. Yes, the history lesson is fascinating. The city tour is interesting. But the fun-loving, dance-party, hip-gyrating, musical renditions thrown out between facts by your duck Captain is what really will keep you, your teen, your Grandma and your teeny little ones entertained during the 90-minute tour. The kids had a blast and I was charmed by the Captain’s one-liners throughout the tour as well. Following Ride the Ducks on Twitter through @SeattleDucks is also a comical way to keep up with their antics. From social media egg hunts to initiating conversations with the Seattle Seahawks, their playfulness online is engaging and fun to follow. Momma tip: If you decide to ride in November, before the holiday season, find the Duck that is collecting new, unwrapped toys for Starlight and teach your child the concept of giving. Each year they host a “Stuff the Duck” event collecting toys for children. Ride the Ducks of Seattle has also donated more than $40,000 to the Starlight Children’s Foundation over the past four years. Personally, I’ve always felt great about giving my business to a company that gives back to the community. Now, what are you waiting for? 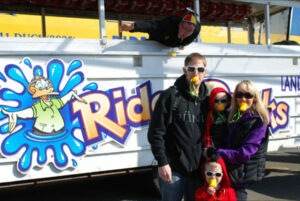 Put your party hat on, get yourself aboard a duck, and get ready for a quack-up of a good time!